“You have to remember, this is post-Emancipation rights. So not a lot has changed for black people—but the two things that they did have was geographic mobility, and autonomy over their own sexuality,” said director Dee Rees, regaling national TV critics at a confab earlier this year about what drew her to Bessie. The two-hour drama based on the life and career of iconic singer Bessie Smith, airs on HBO this Saturday, May 16th at 8 p.m. 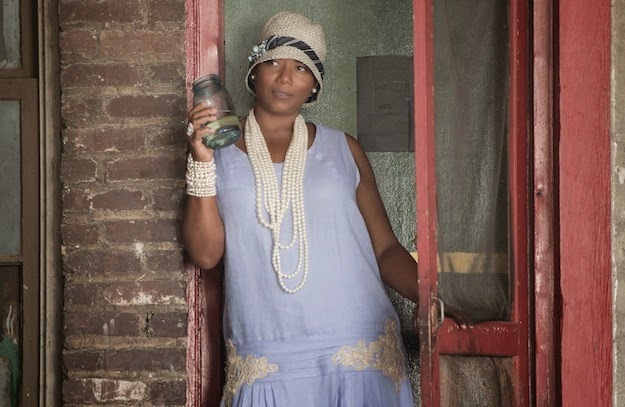 The film stars Queen Latifah in an Emmy-worthy performance as the “Empress of the Blues,” which follows the singer’s transformation into one of the most successful recording artists of the 1920s and 1930s. More than just a musical biopic, the film embodies the social changes of African-Americans at the turn of the century, and the women whose musical texts embodied a rich cultural legacy and a new frontier for women—who were predominantly the stars of popular music during that time. In this sense, [Bessie Smith] further developed the legacy of Gertrude Rainey, whose socially oriented music constituted an aesthetically mediated community-building and assisted in developing a specifically African-American social consciousness. Rainey’s work was inextricably linked to the experiences of black southerners, the vast majority of whom were still tied to agrarian life. Smith’s art, while obviously rooted in black rural culture, also reflected new historical experiences of the urban immigrant communities of the North. “In a male dominated kind of world, seeing these black blues women who were able to create public discourse like blues and their live repertoire was sometimes the only public discourse of women’s issues,” said Rees. These were the feminists—the womanists—of the day before there was even a moniker, and their music was the only place where they could directly criticize the systems that they were being oppressed by. 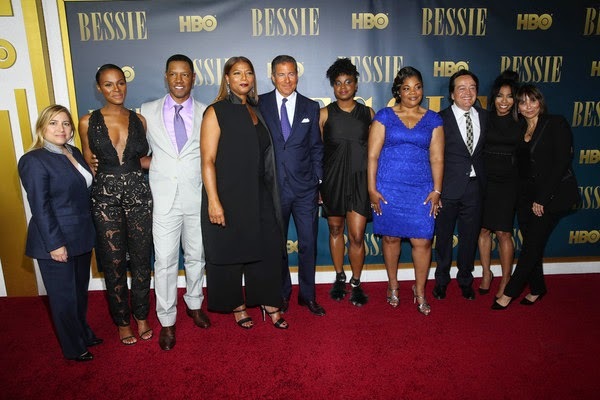 “So I started with Bessie’s own lyrics—the songs that she wrote, as a way to try to really understand who she was,” said Rees, who signed on last spring to helm the project, rewriting the original screenplay first drafted by playwright Horton Foote. 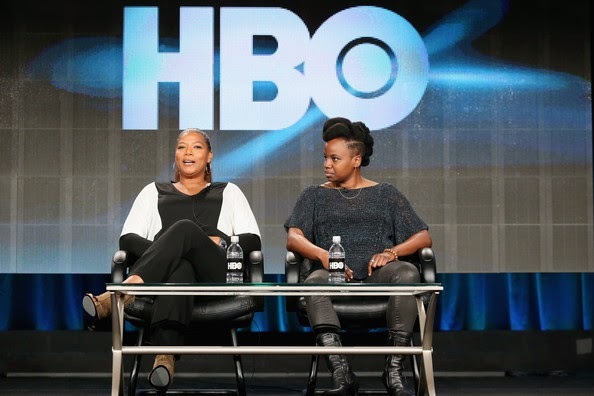 By then, Bessie had already been in development for more than twenty years, when producers Lili Fini Zanuck and Richard D. Zanuck approached Queen Latifah about playing the title role. That life experience has allowed Latifah to inhabit Bessie as she moved through her knock-down-drag-out days on the vaudeville circuit to her professional highs, while battling her personal demons along the way. And Queen Latifah’s two decades in the entertainment industry has given the Grammy-winning performer a generous span in which to sharpen her thespian chops, having now earned an Oscar nomination for the film adaptation of Chicago and two Golden Globe nominations, including a win for HBO’s Life Support—for which she also garnered an Emmy nod. Surrounding Latifah’s indomitable performance is an equally formidable supporting cast, including Michael Kenneth Williams (Boardwalk Empire) as Bessie’s husband, Jack; Tika Sumpter (Sparkle) as Bessie’s lover, Lucille, and Mike Epps (The Hangover) as Bessie’s romantic interest, Richard. But it’s her relationship with Ma Rainey, Bessie’s mentor, adversary, and eventual savior—superbly performed by Oscar-winning actress Mo’Nique (Precious)—that is one of the hallmarks of this story. The role of Bessie’s older sister, Viola, rendered with the subtle aggressiveness that only Scandal’s Khandi Alexander can bring to the screen, proves yet another highlight of the piece. And, frankly, audiences deserve Bessie, too. Janice Rhoshalle Littlejohn is a journalist, author and film artist. Follow her on Twitter and Instagram @janicerhoshalle.